My wife and I went on a date last weekend to see The Giver and we both really liked the movie. It was a faithful adaption of the book and I felt it was a good movie on its own as well. There are a few additions to the movie and a few things removed as well. Of course this sort of thing always happens in movie adaptions of books. For example, Two scenes that I really enjoyed were not present in the movie, Jonas tossing an apple and seeing it turn red in the air, and a more direct explanation of precise language that Jonas receives from his parents. In the book, Jonas says he is starving. His parents correct him and say that he is only hungry, not starving. 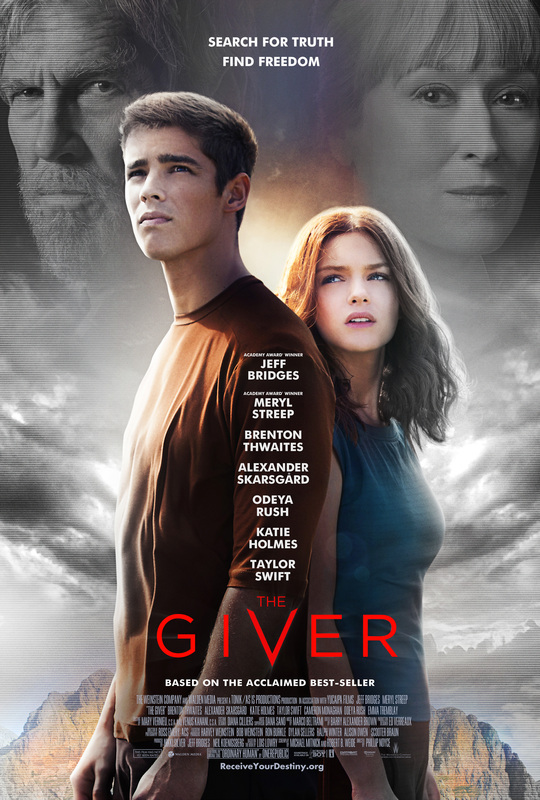 The movie skips that scene, but contains plenty of other pieces of dialogue that illustrate the precise use of language the people have developed in The Giver‘s utopia. My wife was disappointed that the movie did not include the variety of gifts the children receive for each year of advancement. Only the bike at year nine is in the movie. The special effects and acting in the movie were excellent. I loved that it switched back and forth between black and white and color. Jeff Bridges and Meryl Streep were amazing as always and the young actors put forward impressive performances as well. My wife’s major complaint (and I agree with her) was that the movie was too short. It’s only about an hour and a half long. The movie could’ve easily been lengthened and included all the things that we missed from the book. I’d definitely recommend the movie for those who enjoyed the book or for people who get as excited about utopia/dystopia stories as I do. Oh! And fair warning, Taylor Swift is in this movie and it utterly destroys your suspension of disbelief when she shows up.